One of my favorite things to do when cooking is taking a traditional dish and changing it up a little bit, which is what I did for dinner last night when I needed to come up with a hearty side for my leftover piece of grilled salmon. I had a sad-looking bell pepper, a tomato or two, and an onion hanging out in my fridge that needed to be used up before I went shopping at the farmer’s market today. So I decided to make a play on succotash, a traditional veggie side dish. Succotash is a side that consists of corn, a shelled bean (usually lima beans), tomato, and bell pepper. I knew that I had some frozen corn kernels in the freezer but I definitely knew that I didn’t have any lima beans… but I did have edamame! And tada (! ), edamame succotash was born. 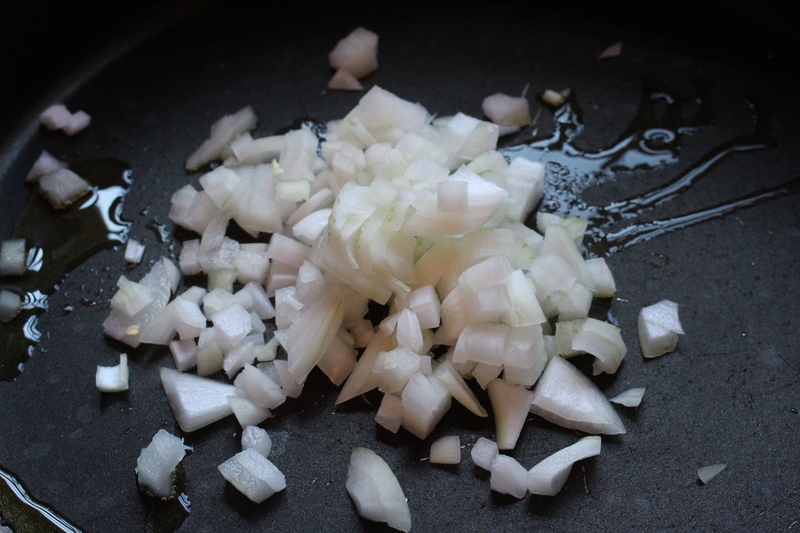 … and adding in some chopped onion. If you want to be super colorful, you can swap a red onion for the white onion. When the onion became soft, I added in some garlic. Because who doesn’t love onion and garlic together? And then I tossed in a finely diced bell pepper. Again, if you want more color contrast, you can use a red pepper instead of an orange one! When the pepper begins to soften, that’s when you have to add in the stars of the show! I threw in some frozen shelled edamame and some frozen roasted corn kernels (along with some salt and pepper). The roasted corn adds a little smokiness to the finished dish, but if you just have regular corn kernels, those work too! (PS – you don’t need to thaw the veggies before adding them! They will defrost quickly in the skillet). When the corn and edamame are just barely heated through, the last two ingredients can be added. One diced tomato and two to three teaspoons of rice wine vinegar (depending on how tangy you like your food). I like adding them in the end because the tomatoes just need to warm through (so they don’t start breaking down/falling apart) and I don’t want to vinegar to cook off. Look how colorful (and healthy) it all looks! I love one skillet sides that have both the starch (the corn) and the veggie (edamame, bell pepper, tomato) in it… easy clean-up! It was the perfect summer side to my leftover salmon. 1 cup frozen roasted corn kernels – regular corn kernels work here too! Add in the onion and cook until just soft. Add in the garlic and cook for approximately 30 seconds or until fragrant. Toss in the bell pepper and cook until soft, 1-2 minutes. Add in the edamame, corn kernels, salt, and pepper and stir to combine. Cook the veggies 2-3 minutes until edamame and corn kernels are just barely warmed through. Add in the tomato and rice wine vinegar and continue to cook for 1-2 minutes, or until the tomato is warmed through. Serve alongside your grilled favorites, toss into salads, or eat it by itself. Enjoy!